Next post the pictures I promissed you all. 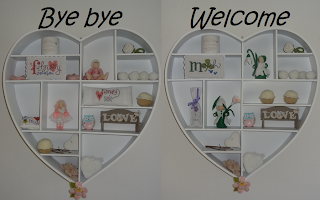 My cute February heart shelf turned in too a green March heart shelf. As you see the March Lizzie Kate piece is already finished. Here she is with 2 crochet roses I tryed out!! And a big collage from our Vacation.. Your little March doll is so pretty with the snowdrop..i really love the look of your March shelf.. So adorable! Again those dolls are just the cutest things EVER! Heel mooi! Een prima idee om af te wisselen, zo heb je steeds iets nieuws in huis. March is full!! Already :D well done sweetie! I love to see the pictures like that, side to side :) Lovely!!! You've made so many beautiful things! You are definitely on fire this year :D Wonderful! wonderful!!! Ohhhhh that snowdrop doll is the cutest! I love her =) Do you know one TV show called 'Once upon a time'? It's one of my favorites and just yesterday I watched the lastest episode, there were real snowdrops flowers :) So pretty! En een erg schattig popje. Ik begin te overwegen om me ook wat meer in vilt knutsels te gaan verdiepen als ik dit allemaal zo zie! decorate the heart shape each month. Hi Annette, it's the first time I visit your blog and I'm loving it! 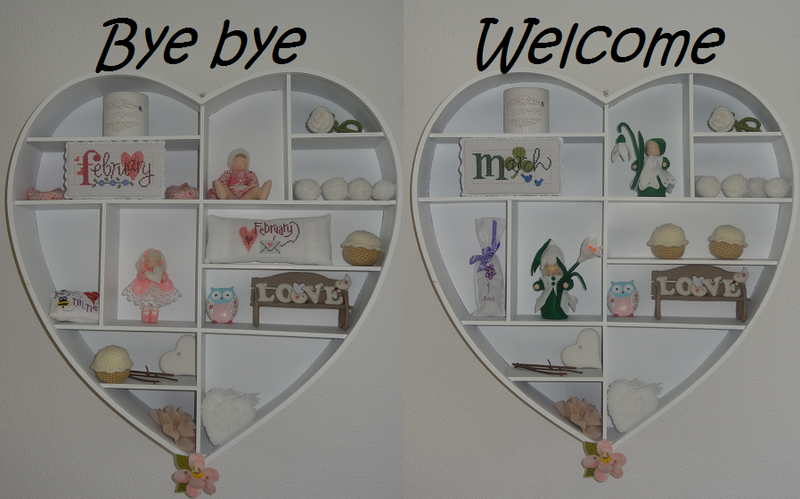 You heart shelf is lovely! Leuk idee met de harten Annette! En je hebt er een mooie nieuwe hobby bij,de popjes zijn enig! !